CNN.com's Lisa Respers France blogs live during the "American Idol" results shows. Join her tonight at 8 at the Marquee Blog. LOS ANGELES, California (CNN) -- Perhaps Ryan Seacrest said it best at the top of the "American Idol" Tuesday night when describing Adam Lambert and Kris Allen, the show's final two contestants. 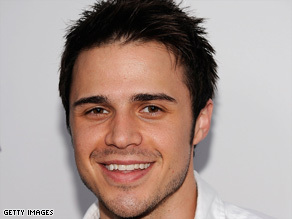 In this corner: Kris Allen, the guy next door. "It is the battle of the acoustic rocker versus the glam rocker. Conway (Arkansas) versus California. The guy next door versus the guy-liner." After three performances apiece and plenty of judge feedback, it seems that the Southern California glam-rocker Adam Lambert has the edge -- but it didn't look that way early in Tuesday's show. Lambert chose to sing "Mad World" while wearing a long black coat and walking around a stage filled with white smoke, all of which Cowell found "over-theatrical." "I think 'Mad World' is kind of symbolic," Lambert told reporters after the show. "It talks about people who don't feel like they fit in." Round two featured a tune hand-picked by "American Idol" creator Simon Fuller, where Lambert ditched the black overcoat and belted out Sam Cooke's "A Change Is Gonna Come" while sporting a shiny silver suit. Paula Abdul told Lambert "it was the best I've ever heard you sing, ever!" "I thought it was too laid back for a night like this," said Cowell. He then gave round two to Lambert. "American Idol's" Adam and Kris join CNN's Larry King and take your questions! Round three featured a bit of a twist -- both contestants had to sing a song co-written by judge Kara DioGuardi called "No Boundaries." Lambert went first and had little difficulty with the ballad. Cowell told the 27-year-old afterward that "you have been one of the best, most original contestants we've ever had on the show." Allen, however, struggled to stay in tune during the entire performance ... but the judges were less harsh this time. After the show, Lambert told reporters that they did not have a lot of time to work on "No Boundaries" and it was kind of a "rush job." "There was a lot of lyric, and it was a big song," said Lambert. "But it's a beautiful song." CNN blog: What did you think of Tuesday's show? It almost seems appropriate that these two are facing off in the finale. According to Allen, he and Lambert were once roommates during the competition. They even critique each other's rehearsals. "He's always giving me stuff to change about mine ... to make it better," Allen told reporters. iReport.com: Who should win: Kris or Adam? A little over an hour before the show began, a magnitude 4.0 quake aftershock hit 10 miles southeast of downtown Los Angeles. Tuesday night's telecast was held at the Nokia Theater, which is in downtown Los Angeles. A 4.7-magnitude earthquake struck the area shortly before 8:40 p.m. Sunday. But, to Allen's disappointment, neither of the contestants felt the jolt Tuesday. "I was totally upset, too, because I've never been to California (except for 'American Idol'), and I was like, 'I want to feel an earthquake.' "
Allen and Lambert will return to the stage Wednesday night and find out, along with the rest of the world, who will be crowned the next "American Idol" at the two-hour finale.